IT has equipped police here with substantial new powers to decide on the spot who can avoid a criminal record and going to court for minor offences – but so-called ‘Speedy Justice’ has been rolled out here virtually unnoticed and major disparities in how it’s being applied are already showing up. The Detail has investigated the use of Discretionary Disposals or “Discretion” a key policy under the Speedy Justice banner, which was introduced here in March 2010. The policy is supposed to divert people, particularly young people, away from the criminal justice system. Until discretion was introduced here, formal cautions and prosecution were among the only official avenues which could be pursued. Both involve the Public Prosecution Service but discretion allows a police officer on the ground to choose to deal with a minor offence on the spot him or herself and to impose sanctions without reference to the Public Prosecution Service. Data obtained by The Detail under Freedom of Information (FOI) requests shows that discretionary disposals have been used 32,000 times with huge variances in where they’re been used as well as the types of offences they’ve been applied to; the data shows they’ve been used in cases of sexual assault and aggravated assault. A Discretionary Disposal is supposed to be used for “minor offences” and can only be issued when the suspect admits the offence and is not a persistent offender. Discretion does not result in a criminal record, however, police can still obtain details on the offender for anything for up to 12 months, which may be subject to disclosure as part of an “enhanced” criminal record check. As a consultation on the system nears completion, an organisation which supported the scheme at the start has flagged up serious concerns, including the fact that it is being used by officers on a daily basis without being properly tested. South and East Belfast (District B) had the highest number of discretionary disposals per 1,000 people amounting to almost three and half times more than the number issued in North and West Belfast (District A). Sexual assaults, fraud and drug-related incidents are among some of the offences that discretionary disposals have been used for over the past three years. Despite being active from early 2010, an Equality Impact Assessment on the policy was only carried out in November 2012, with consultation findings due to be published in March this year. In May 2006, the Criminal Justice Inspectorate (CJI) carried out an extensive review of the Northern Ireland justice system, with a particular focus on the often considerable time that was taken to process cases through the formal justice system. In recognition of this delay, CJI recommended that more cases, and especially youth cases, should be diverted away from the Public Prosecution Service (PPS) and the courts by use of police informed warnings and cautions. A working group was created between the PSNI and the PPS to look at ways of reducing delays and, where appropriate, removing cases from the formal justice process. The ‘Speedy Justice’ initiative for non court disposals was one of the outcomes of these deliberations. While a number of non-court disposals are available to the PSNI such as an immediate caution, this requires the police to make a recommendation to the PPS who will then decide if a caution can be given. 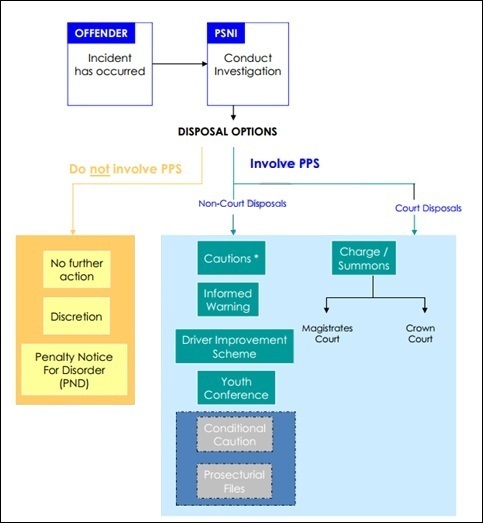 However, there are only two disposal options that are currently available to the PSNI, without a referral to PPS, these are Discretionary Disposals (discretion) and a Penalty Notice for Disorder (PND). They are meant to be an alternative way of dealing with crimes that are comparatively less serious and have less impact on those involved. A PND provides a monetary penalty, for a fixed amount of either £45 or £85 depending on the offence, as an alternative to prosecution in prescribed circumstances. However, PSNI Chief Inspector Michael Kirby believes Police officers in Northern Ireland have the ability to make tough calls. He said: "In Northern Ireland because of the history and sensitivity of policing, there’s probably been a culture here whereby police on the ground have had nothing to do with decision making, with no discretion involved. Now the PSNI is ten years old and hopefully we’re in a more mature place within society. “The idea of discretion was that we could record a crime as we’re required to do. However, instead of the officer having the ability to say ‘don’t do that again’ and nothing else is recorded , with discretion everything that happens with the offender is documented. In effect it’s a way of the officer to record low level crimes in a more formal way, without having to go through the courts. It is the responsibility of the investigating officer to decide what constitutes an appropriate outcome with a discretionary disposal. This could comprise any number of actions including a verbal or written apology, completing unpaid work or the repair of any damage caused. Discretion is currently the focus of an Equality Impact Assessment (EQIA), as it remains the primary responsibility of the PSNI to identify if there is any adverse impact on any sections of the community. A consultation on the findings of the EQIA was launched for a period of 13 weeks from November 30 2012 to March 1 2013. However, for the first time through data requested under Freedom of Information (FOI) legislation we can reveal the true extent to which the policy is being used on the ground. The figures obtained by The Detail raise questions about the type of offences that police officers are currently using the discretion policy for, especially with young offenders, as well as highlighting huge gaps in how the policy is being disproportionately used across Northern Ireland. For more information on the types of offences discretionary disposals are being used for, click here. Policy Co-ordinator for Include Youth, Paula Rodgers, says the fact that a proper assessment on the policy is only being carried out now is a huge oversight. She said: "The fact that the EQIA wasn’t done two years ago when this scheme was being piloted has led to serious gaps in procedures. In principle we supported speedy justice, but unfortunately looking at the statistics highlighted by The Detail, some of the concerns we highlighted early on in the process seem to have been realised. Ms Rodgers believes people have been made “test subjects” for the policy. She said: "If the proper assessments of this policy had been done before it was rolled out I think there would have been more opportunities to iron out some of the problems we’re seeing now. What’s happening at the moment is a retrospective consultation. “This policy is up and running, it’s live on the streets now, there are discretionary disposals being issued while there are issues and concerns about how it’s being delivered. Really we would be saying to the PSNI you need to get back to the drawing board and look at some of the issues the data is flagging up. However, Chief Inspector Kirby says it was important to build up enough data before any detailed assessment could take place. He said:"“The EQIA needs a significant volume of data to allow for any sort of meaningful analysis so as discretion was a new disposal for Northern Ireland we had to build this up. In a report from July 2011, the CJI said the delivery of Speedy Justice needed to be monitored to ensure that decisions and subsequent warnings were not delivered with undue haste. The report highlighted concerns that its use may not be appropriate in the context of the history of Northern Ireland, in particular the potential for compromising accountability and transparency in policing. The figures obtained by The Detail show that there have been 32,000 discretionary disposals issued by the police from March 2010 to November 2012. However an examination of where the disposals are being used expose what critics say are glaring inconsistencies in how the policy is being rolled out across Northern Ireland, particularly in different parts of Belfast. 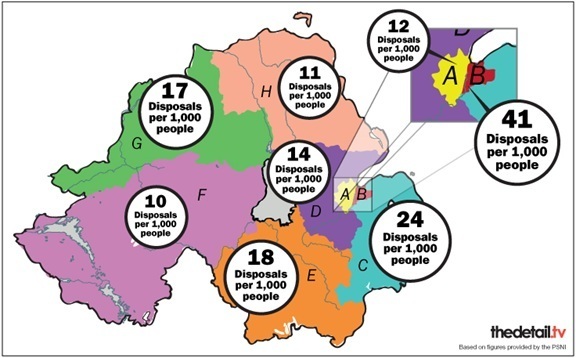 Using the PSNI’s population estimates for each district, the figures shows that South and East Belfast (District B) had the highest number of discretionary disposals per 1,000 people. This amounted to almost three and half times more than the number issued in North and West Belfast (District A). Please see the bottom of this story for a full breakdown of each police district. In a statement to The Detail the PSNI said that the policy had been rolled out in South and East Belfast two months before it was used in North and West Belfast. For a full break down of when the policy was implemented in each district click here. Chief Inspector Kirby says that a number of factors need to be considered when interpreting the data. He said: "The data clearly paints a very complex picture and I don’t think it’s as simple as making direct comparisons between the districts. “With any city centre there is a huge increase in the transient population, with non residents that are either working there during the day time or enjoying the night time economy. So I don’t think it’s a true and a fair reflection to make that comparison. However, Ms Rodgers says the data highlights a worrying trend. She said: "Looking at the figures the first question that comes to mind is why are there different levels of discretion in certain areas, particularly across Belfast? The police may say this is a result of the fact that people have to admit guilt to have the disposal offered to them and if that’s not happening in particular areas you can’t force people to go down this route. “However, I don’t think that’s a good enough answer, I think we need to ask why this is the case. Why are people in certain areas not seeing this as a viable option? I believe in order to answer that we need to look at police relationships within certain areas. The danger is that if it’s happening in differently in different areas potentially we could be saying this is postcode justice. " The data shows that the age group receiving the most discretionary disposals from March 2010 to November 2012 was 18. Since the inception of the Speedy Justice scheme, concerns have been raised by youth groups regarding the use of discretion on young people. Under The Police and Criminal Evidence (Northern Ireland) Order 1989, “arrested juvenile” means a person be under the age of 17. According to figures released to The Detail under FOI there were almost 50,000 (49,909) juvenile arrests made by the PSNI between April 2010 and March 2012. The number of discretionary disposals in the same period for people under 17 years was 2,109, while the number of juveniles convicted of a crime was only slightly less with 2,045. When the number of juvenile discretionary disposals is compared with the number of juvenile arrests between Belfast’s two districts, the figures once again highlight stark inconsistencies. Between April 2010 and March 2012 North and West Belfast had six times more juvenile arrests (5.7) than discretionary disposals, were as South and East Belfast only had two and a half times more juvenile arrests than discretionary disposals during the same period. A further breakdown of the data provided by the PSNI show that of the 32,000 disposals from March 2010 to November 2012, around 10% (3,124) were issued to juveniles. An analysis of the top ten offences committed by offenders between the ages of 10 and 16 show the most common offences consisted of shop lifting and criminal damage. However, more serious offences such as aggravated assault and possession of a class B drug were also present. Click on the spreadsheet at the bottom of the story for a further breakdown. Ms Rodgers says there’s still a lot of work to be done with regards the implementation of the policy. She said: “At the minute Northern Ireland is not ready for speedy justice, there are too many question marks about how this is being operated live on the streets.